Your Subconscious Mind Holds the Key to Being Able to “Make Room” in Your Life for (and/or to Handle) that New Person in Your Life! 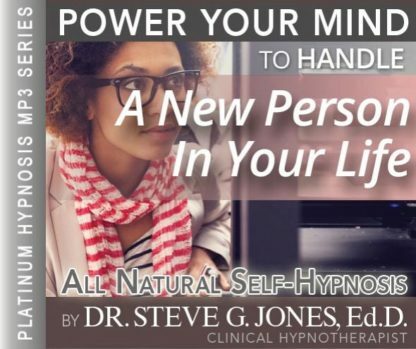 Steve G. Jones, Ed.D., Clinical Hypnotherapist, charges $1,500 for a custom recording and $25,000 for a one-hour private hypnotherapy session at his office. But you can get all the benefits for this low price. Simply listen to the Handle A New Person In Your Life Hypnosis MP3 every night as you go to bed for three weeks and feel the changes happening in your life. You will feel more empowered, more in touch with your true self, and you will truly know that your goals are within your reach. Dealing with this situation is easier than you think. Steve G. Jones achieves AMAZING and LASTING results!!! Hypnosis is the easiest way to affect change in your life because the positive messages go straight to your subconscious mind effortlessly so you can accomplish your goals and reach for the stars!! All you have to do is listen to the Handle A New Person In Your Life Hypnosis MP3 download at night as you go to sleep!!! You’ll hear soft music, the gentle sounds of the beach, and the soothing sound of Steve G. Jones’ voice all working together to bring about positive changes in your life easily and naturally. Steve G. Jones has been helping people improve their lives with hypnosis for over 17 years…now it’s time for him to help YOU… don’t wait, do it NOW !!! you’ll be glad you did. See you at the top! And as you continue relaxing deeper, deeper, and more deeply relaxed, you realize that you are very powerful. You realize that your mind is capable of accepting a new person in your life. You are a very positive person and you enjoy welcoming new people in your life. You realize that this person may have different opinions than you, and you realize that’s fine. Whether this person is a friend, a significant other, a roommate, or anyone else, you are open to forming a relationship with them. This person is in your life for a reason and you enjoy getting to know them. You can easily handle this new person in your life. You realize that you are still yourself when you are around this person. You do not change who you are when you are around them. You enjoy going through new experiences with this person. You realize that they can add a lot to the quality of your life. Picture yourself with this person; picture the two of you participating in one of your favorite activities. Perhaps you both are going to the movies, perhaps you both are cooking a meal, whatever it is that you enjoy doing, imagine the two of you having fun participating in it. You get enjoyment out of this new person in your life. You are a very accepting person. You allow this person to come into your life and you both compromise. You both realize that you are going to have to give a little and the new person in your life realize that they will have to give a little to. You are happy with opening up your life to this new person. They return your gesture and they too are happy with opening of their life to you. You are accepting of this person even for their faults, because you realize that you have faults too and the new person in your life is accepting of your faults. You are also a very understanding person. You understand that the new person in your life has feelings, wants, needs, and goals and you are very open and supportive of their feelings, wants, needs, and goals. You are a good friend to this person in your life. You both are able to communicate and talk with each other about everything. You both open yourselves up and you feel confident that you can be supportive and in return, they will be supportive of you. Picture you and this person six months from now. Look at how much the two of you have grown to enjoy each other and support each other. You both have come a long way. You are confident in your relationship with this person. They are no longer new in your life and that feels good. You feel as though you know them very well and they are very trustworthy. You also look forward to the future because you know that your friendship or relationship with this person will continue to grow. Both of you have enriched each other’s lives. You are a more positive person because of your relationship with this person. You have so much confidence in yourself and the relationship you have. Now, I want you to picture yourself one year from now. Look how you continue have continued to grow as a person, and your friendship continues to grow with that person in your life. You lead a very fulfilling life. You are accepting, supportive, and understanding of this person and in return, they are accepting, supportive, and understanding of you. You have grown together in the past year. You have experienced great times and some difficult times, but you continue to be strong and live a very fulfilling life. And as you drift and relax, you realize that everything is going to be just fine. Accepting a new person in your life can be a hard adjustment, but it does not have to be when you listen to the Handle A New Person In Your Life Hypnosis MP3 program. Whether you have a new significant other in your life or a new friend, hypnosis can make things easier on you. This powerful hypnosis session will help you accept any new person into your life. Not only will you learn to easily let them into your life, but you will realize how important it is to not lose your sense of self when handling a new person in your life. A lot of times, when people allow someone new into their life, they lose a little bit of themselves. This will not happen with this powerful self-hypnosis program. They will be a positive addition into your life! We suggest you listen to this Handle A New Person In Your Life Hypnosis MP3 recording for 3 weeks, every night before going to bed. You will feel relaxed as you enter a deep state of hypnosis. 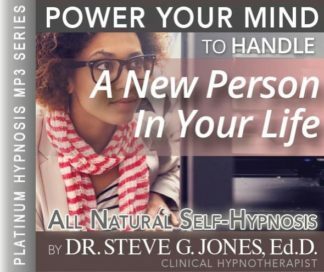 While under hypnosis, Steve G. Jones will deliver positive suggestions to help you handle a new person in your life.